A thought has been haunting me recently. 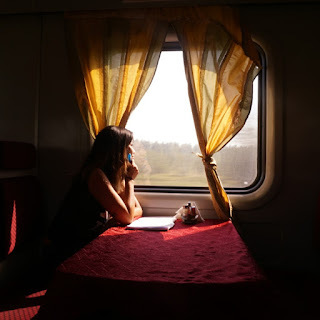 I soon realized that I haven’t written in such a long time (yes, you do get in that busy train but that is still no excuse). Having that factor in mind made me conscious about another matter as well, for there has been a lot going on lately that I haven't been able to write down either... "emotionally” about...well, certain things. I am in complete doubt when it comes to giving a simple and concise description -- an explanation -- to, for instance, relationships: are we talking about a fling here, can this be friendship, something real perhaps? Situations: it does seem ambiguous, even wrong, can it all be worthy? Feelings: are we just dealing with infatuation, are there butterflies, or is it a case of obsession? People: …, …, …? What are you thinking, mate? What happens when you actually aren't capable of judging anymore? The world just turned the other way around. Ironic… Don’t you think? Define. Categorize. Label. Although our conviction brings us to believe that we aspire to live in this non-judgemental society, it soon became clear to me that it is an impossible and unattainable goal. In every situation we are to encounter and every person who we will get to meet lead us to judge: for we are always to speak our mind (silently and/or out loud). It is said that the only one to judge you is GOD. And even how strongly we agree with this statement -- because it is indeed true, we are all aware of the fact that in the meantime, there are a countless number of eyes which will cross our path: other of our family members, the friends, our boyfriends/girlfriends, our neighbours, the immense internet network, our everyday people, our everynight people, our not-so friends, we also get to judge ourselves … need I say more? We might evidently not care about how and by whom we are seen. But the thing is, we are always seen and labelled. How you are and want to be seen is just a question of taste. De facto it is the same regarding our standing point while we try to analyze a certain situation or a relationship, aren’t we always putting a name on it (instead of letting it flow)? Don't we turn to our circle of friends and loved-ones to ask for their honest opinion on the matter? And finally, when it comes to emotions… well, yes, our heart is the only one to answer all the questions one desires. Our society can be free-flowing and open-minded, as we want it to - or as it should be. But it will never be not judgemental. We really need to acknowledge the fact that -- when it comes to all the elements in/of our society --, it is a real judgement call out there. However, once again, labelling is not always heading for the negative or that shaky road as we may often fear. At the end, it just truly makes the mind a little lighter as we shape every single definition: about people, feelings, situations, relationships. I have been told that I am someone who has tendencies of seeing things in either “white or black"... at extremes. Perhaps it is a flaw, I agree. But at this very moment, I am right about wanting to define, to wish to categorize, to really get a label. Know where to stand, doubting is a killer.